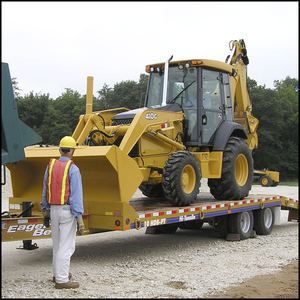 A complete transporting construction equipment training instructor "tool kit" for teaching mobile equipment loading, tie-down, transport and related transport trailer topics or for refresher training of experienced operators. Provides instructors who don’t have time to develop their own equipment operation and safety training programs, a comprehensive training presentation and a complete set of learner materials. This instructor kit applies to municipalities, mines and quarries and general construction - basically, any entity that owns this equipment. It covers a wide variety of machine brands and working conditions. Many customers have told us they have experienced people on staff who can teach transporting equipment and related safety topics, but they often lack the time and / or skills to develop a professional training program. That is why our training tool kits include "everything but the instructor"